Click here to send in a nomination! Why I Dance: "I dance for the miracle kids and their families. To have the opportunity to bring a smile to their faces is the reason why I dance." Why I Dance: Clare- "I dance for so many reasons but one of the main ones being for the families that have the Miracle Kids in the their families. They are so strong to be going to and from the hospital and helping their little one go through such a hard time. I love hearing the stories of the bonds that they make in the hospital and how the families become stronger each day due to the Children's Hospital. 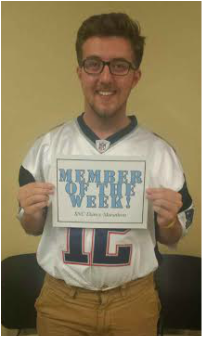 All the stories I hear are so positive and I'm touched that I get to experience it all through SNCDM!" Leah- "I dance to help support children and their families who are facing some fo the most overwhelming and difficult times imaginable I am honored to be able to contribute to SNC Dance Marathon and all the wonderful things this organization does for the Children's Hospital of Wisconsin and its patients. FTK!" Why I Dance: "I dance because I love to see people smile! One of the ways I can bring more smiles to the world is by helping raise money for the Children's Hospital of Wisconsin through DM. It's a super fun way of making sure that I do as much as I can to help these kids and their families have lifetimes full of smiles. :D"
Emma: Meeting all the families and dancing! Emily: The energy that is within the room on miracle day! The range of emotions that can be felt from just stepping into the room is truly amazing! The morale dance is also one of my favorite activities during the day! Joey: "Hearing all the stories and the Disney Hour!" Caytie Joe: "My favorite thing about Miracle Day is seeing all of our hard work and planning come together - and seeing everyone's reactions to the day!" Emily: "I love watching all of the dancers experiencing Miracle Day for the first time. There is something incredible about several hundred very different people coming together for 13 hours to make a difference for families and children that they get to meet in person." Katherine: "My favorite part of Miracle Day is the last Morale Dance of the day after the final reveal!" Favorite Part of DM: The Morale Dance! Favorite Part of DM: The Morale Dance because we are all dancing for a common cause as we dance in unity as a community! Favorite Part of DM: The final reveal and the moral dance! Favorite Part of DM: The energy that is within the room on miracle day! The range of emotions that can be felt from just stepping into the room is truly amazing! The moral dance is also one of my favorite activities during the day! Favorite Part of DM: Family talks and the reveal at the end of the day! Favorite Part of DM: "My favorite part of Miracle Day is the energy! Everyone gets so excited for the families and organization and it's truly contagious. I think it would be nearly impossible to go to Miracle Day and not come away with those warm fuzzy feelings, a huge smile, and some great memories." Favorite Part of DM: The morale dance, and looking out at the crowd and see a group of people dancing for a unified purpose. There is so much energy in the room! Favorite Part of DM: Listening to all the family talks and getting to know the families. Aaron: His favorite part is the big reveal at the end. He loves seeing the excitement building throughout the day for this moment! 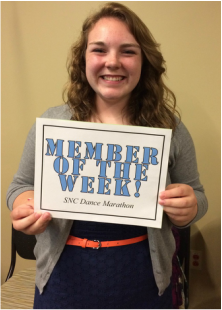 Keely: Her favorite part is doing the Morale Dance every hour and the closing ceremony. She loves seeing everyone come together at the end of the event! Favorite Part of DM: My favorite part about the Dance Marathon event was seeing all the SNC students put aside all responsibilities and spend a whole Saturday dancing to raise money for kids that may not be able to. It was through this that, I really see the good in the SNC student body. Favorite Part of DM: I love being able to see everyone rally together for a cause. It's amazing to see the gym full of the SNC community to support such amazing miracle kids, strong families, and one phenomenal organization! Favorite Part of DM: I am looking forward to the entire experience: meeting the families, dancing for an incredible cause, and seeing everyone's hard work pay off when the total is revealed at the end. Favorite Part of DM: My favorite thing about Dance Marathon is just the overall passion and excitement everyone has. Whether it's those who have spent a whole year planning the event, participants, or the families, everyone is gathered together for the same purpose. We dance for those who can't, and it's such an inspiring thing to see and be involved in.. Favorite Part of DM: My favorite part is the morale dance. The morale dance is a magical experience. For five minutes we are all in sync with each other. It's like we're one heartbeat, beating to give the kids who are struggling a chance. Favorite Part of DM: I love the moral dance and experiencing the joy as we join together in dance at the top of each hour! Favorite Part of DM: Adam - Just the atmosphere of the day and all the families that are able to participate and speak to the group. Katie - I love hearing the family's stories and getting to meet them and interact with them throughout the day. Seeing the whole day come together after all our hard work is pretty awesome too! Favorite Hobbies: Adam - Watching movies (particularly Disney), Wakeboarding, Mixed Martial Arts, Snowboarding, outdoorsy anything, and playing with puppies or kittens. Katie - ROTC, listening to music, running, hanging out with friends and family, and playing with puppies! Favorite Part of DM: Vince - My favorite thing about Dance Marathon is the impact we have on all children affected by illnesses. The standing for 13.1 hours and the dancing all has meaning which makes the experience so much more impactful! Meghan - The final reveal of the total fundraised amount is definitely my favorite part of the event. The amount of emotions that come out in that one moment is unreal and so utterly inspiring. It really shows that you can do anything if you put your mind to it! Favorite Part of DM: The scream that the Fundraising and Sponsorship committee does when we find out the final number behind the stage. Favorite Hobbies: Anything that allows creativity. Favorite Part of DM: The final reveal to show how all our efforts paid off and, of course, the morale dance! dancing, listening to music, napping, watching One Tree Hill. Favorite Part of DM: My favorite part is listening to the families and their stories along with sharing my story and my brother's. It's amazing to see other people's stories and it continues to motivate me to do the best that I possibly can FOR THE KIDS! 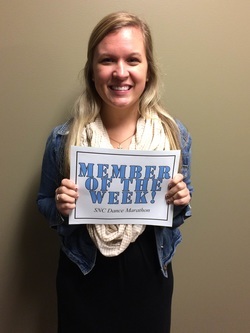 Favorite Part of DM: "My favorite part about the Dance Marathon event is interacting with the families. All of their stories are so inspiring, but it is amazing to see how much they enjoy the event. I absolutely love dancing and playing games with the miracle kids. There is nothing better than the expression of pure joy on the families' faces!" 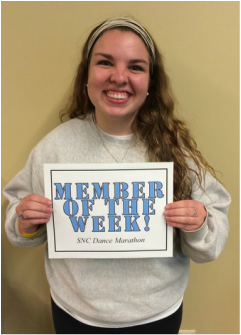 Favorite Hobbies: Dancing, reading, spending time with family, and hanging out with friends! Favorite Part of DM: "The final reveal to show how all our efforts paid off and, of course, the morale dance!" Favorite Hobbies: Listening to music and discovering new artists, dancing, playing volleyball, and going on adventures with friends! Favorite Part of DM: "My favorite thing about Dance Marathon is seeing every dancer do the morale dance together under the lights. Something about having everyone come together to "dance for those who can't" makes my heart so happy, I can't even put it into words." Favorite Hobbies: Tennis, reading, watching Netflix, pranking people, spending time with family, talking to basically anyone, crafting, napping, and being a princess! 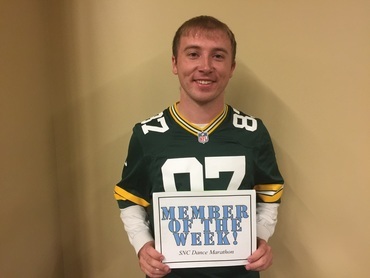 Favorite Part of DM: "My favorite thing about Dance Marathon is seeing all of the students of SNC come together to support the amazing cause! Also, who doesn't love the final reveal?! I love seeing the reactions of everyone in the crowd and knowing our tireless fundraising efforts have paid off! And of course knowing that is all...FOR THE KIDS!! :)"
Favorite Hobbies: Reading, running, fishing, hiking, kayaking, swimming, hunting, and dancing! Favorite Part of DM: "The check reveal at the end of the event and being able to raising money for the Children's Hospital of Wisconsin to help with research, renovations, and treatment"
Favorite Hobbies: Playing guitar, singing, hanging out with friends, playing volleyball and basketball, & watching sports events! Favorite Part of DM: "I love how it is such a laid back group of people, but at the same time a very serious vibe is present so it makes me strive to be better." Favorite Hobbies: Singing like nobody is watching, playing video games, meeting new people, watching Netflix, eating tons of food and feeling bad afterwards for eating so much, & sleeping! Favorite Part of DM: "The final reveal of the total fundraised amount is definitely my favorite part of the event. The amount of emotions that come out in that one moment is unreal and so utterly inspiring. It really shows that you can do anything if you put your mind to it!" 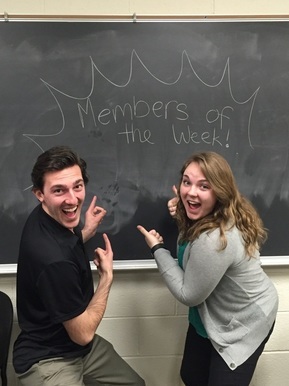 Favorite Hobbies: Singing, crafting, laughing, hanging out with friends, & dancing FTK!